While the image of fresh brinjals from my last post on eggplants Red, White and Green still green in my mind, there is another batch of brinjal plants getting ready for harvest. The variety that I am growing now is Black Beauty. When I went for vegetable shopping a while back I saw this huge black beauty weighing almost a Kilogram. It was priced at Rs 25-30 a Kg. This was enough push for me to start sowing black beauty in my own container garden. With some local searching I was able to get the seeds that said “Black Beauty”. I can hear you saying “Come on! this isn’t black beauty? !” “Its more like purple?”. I too am wondering. May be its the lack of direct sunlight for long hours? May be I was taken for a ride by the seed seller? I dont know. 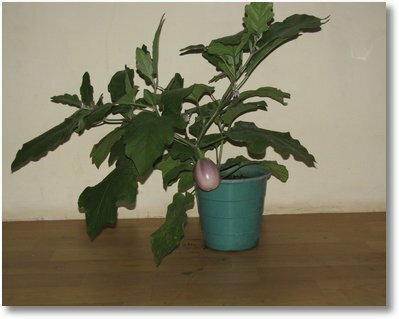 I was expecting a 1kg brinjal from my plant. This one was about 300 gms. But that doesn’t bother me. One might notice a brown scar on that brinjal’s base. 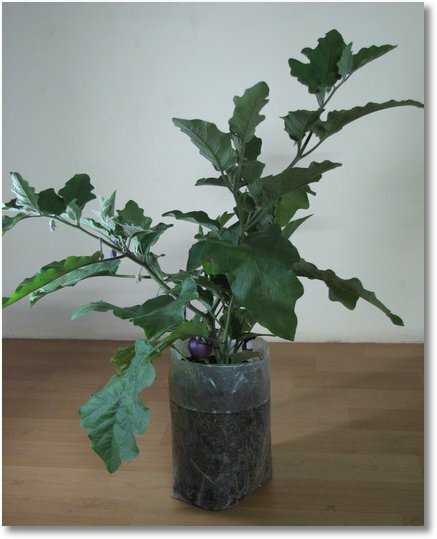 This brinjal was growing so low in a container that it started touching the ground. I had to remove some soil to make room for it to grow and there was a small stone that made its mark on this brinjal. I was shocked to see that spot as I didn’t want this brinjal to be infested with worms. No way. Totally I had 10 plants of this variety but I had only 3-4 big containers . Hence the rest of the plants had to adjust with whatever container they got..
Look at this plant below, that is so happily growing in a polythene bag. Its that simple. You don’t need great containers. A simple thick polythene bag will serve the purpose. I was looking for a black polythene bag but then this one is much thicker than the black ones available in the market.You can see a small brinjal that is growing near the base. There are other vegetables that I am growing right now. Red cabbage, Bitter gourd to name a few. Let me finish give a spicy ending to this post. 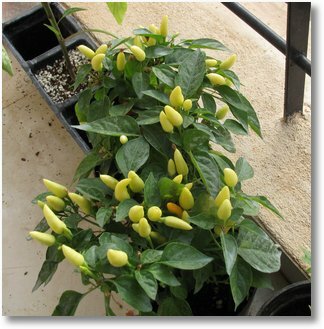 Ornamental chillies in a 4 inch pot!. Been following your posts regularly but was unable to post a comment… however seeing your harvests i felt i must commend your efforts. Do you grow them in your balcony or the terrace ? For a change i too feel tempted to start vegetable gardening but have to yet start off …maybe chillies and tomatoes ? I lost my father last month and am yet to come to grips with normal life still but reading your posts and seeing the fruits [ literally!!] make me feel that life is not so bad after all ….He was diagnosed with final stage of brain tumour in June and passed away in July. I am really sorry and it must have been a difficult time for you and your family. Having gone through the same path, I understand how difficult it is. I am glad you got motivated by looking at the plants. They are indeed great stress relievers. I am sure you will be back in action very soon. For your questions, I have balconies with limited sunlight and I grow in pots, PVC pipes, bags you name it. If you are tempted to start a veggie garden. Just jump in and do it. You will enjoy. Let me know if you want some seeds. Will be more than happy to share. Beautiful garden and excellent harvests. I have one question, so what do you do with so much produce – tomatoes, capsicums etc. I have a vegetable garden too and I always go overboard at planting time and I am left with abundant harvest. Thanks for stopping by. Thats very true, I get carried away and sow a lot. But then, I don’t have too many pots. Usually, I end up with loads of tomatoes which we use generously in our food. Other veggies, I have 2 or 3 pots each so i have just enough harvest for 2 or 3 days. Though Eggplants are no-no in my plate, I love their violet blooms. Ornamental Chillies! I remember seeing them over at Green Thumbs and I so badly wanted them! I am getting more varieties of chillies and tomatoes soon. Just give me some time. Then I will be able to send you some stunning varieties. I can send some seeds from what I have with me now. However, their germination rate is not very good. I don’t have hybrid carrot but I do have ‘RED’ carrot that I got from north india. 🙂 I can send that next week to you. I have sent you an email. lets discuss over email. Black or purple it’s definitely a thing of beauty. It’s always been a pleasure to read your blog. Great going !! Please keep sharing your experiences with us. I too have been thinking of sowing few egg plants for sometime now. But i am facing a different problem since past few days. My lawn grass (Mexican) has got infested with ants and termites and my vegetable patches are in between them. So, they are affecting my vegetables and am not in favour of using any checmicals to treat them. So, am stuggling with few conflicting ideas like replacing the mexican grass with more local variety ones, removing them completely etc..
Hope i’ll find some way out soon… also looking forward to the class from AMEF next weekend. to my new apartment. I got a few flower pots as of now. Where did you get the 4″ pots for the chillies ? Glad to hear that you are starting a garden. Most of the garden shops in bangalore have that 4″ pots. any specific procedure is there ? I am intrested in home gardening, in Bangalore, can you help me? Welcome to my blog. What vegetables are you planning to grow? i have a very basic question about soilless mixture. Can i use unprocessed coconut fibre (got from Kerala) instead of cocopeat? will they work the same way? i.e. a 50-50 mix of coconut fibre + compost for the veggie plants (without any sand/soil), will this make a good medium? The problem with unprocessed coir is its salinity. Its good to soak the fibre well and run water through it several times to remove the salts present in it and it can be safely used. 50-50 will make a good medium. If you think it holds too much water you can add sand to it. Given good moisture and light, it might produce true leaves. You can trasnplant them soon into pots if you want them to grow. If the intention was to just check if it germinates, you can just toss it off. Make sure the roots don’t break when you transplant. Okra is very sensitive. I have been following your blog for a few months now and always end up learning something new. Your idea of the polythene bags as pots is awesome; I am just starting my vegetable garden in pots and find that all my pots are taken up by flowering plants, mostly roses. I will definitely try the plastic bags next, but don’t you see any ants near the base? I have planted a few brinjals (seeds bought from the nursery) of the thorny variety, buds just appearing, I hope they fruit; and tomatoes which sprouted by themselves in the garden soil; and coriander. I used your idea of breaking the seeds into two before planting ( I did not use a slipper, next time maybe). 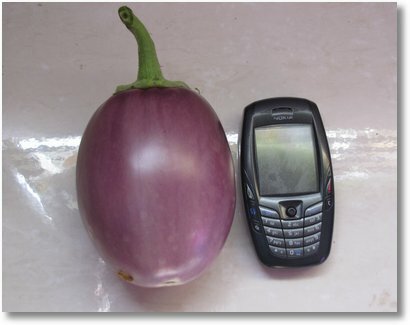 It is great reading your blog, gives a nice feeling whenever I see the tomatoes and brinjals you harvested. Thanks for the compliments Chitra. I get motivated from comments like this. I always end up saying awesome! 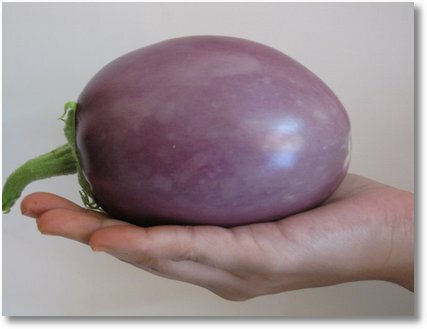 I think I can eat endless eggplant if I grow them beautiful like this! Beautiful vegetables and plants! I would like to ask; what do you feed/fertilize your plants with? The containers appear somewhat small but the plants still look great. I LOVE DOING GARDENING BUT TILL DATE NOT VEGGIES few days before i plant mint leaves actually i dont know how to grow veggies at home when i read yor blog became excited .tell me can we grow veggie in plastic containers and what to mix in soil which fertiliser GG,PLEASE HELP i want to grow coriander leaves,brinjal tomatoes,spinach .you r such a good gardener i saw the pictures you posted on your blog congratulations GG . We are living in farm and would like to adopt growing in bags for commercial scale. We have some lands where soil is not that good and wanted to explore other options. Growing in bags is simple as we can locally have good soil mix and watering locally. No need to farm tilling operations. 1. Do you think that growing in bags hampers root development in any way? 2. Any ideas on yield and plant health? 3. Cost of the bag you have used? Do let me know, we have farm near Mysore. You are doing a marvelous job. i m motivated by seeing the posts. Though I have been following your blog, I happened to read this article only today. I too have some Brinjal plants on my terrace garden, but there are frequent attacks by mealy bugs. Don’t you have them? If they are one or two, I manually pick them. But if I am not attentive for a couple of days, they multiply like crazy. Brinjals are the worst hit by these. What should I do for this. I am discouraged to grow brinjal by these! :(.